Let’s face it, how often is it that men with graying hair end up looking as slick and handsome as Richard Gere and George Clooney? Sad to say, it happens only in that dreamworld they call Hollywood. The truth is, when gray hair starts to appear, one loses that certain oomph. Dry, wiry and gray silently scream to others that you are overworked, stressed and probably unhealthy – even though you may not be. Not to mention what the dull color does to your confidence. And it’s a shame that many teens and adults in their 20s and 30s have to deal with gray hair at a time when they should be at the peak of their beauty. Well, can you really do something about gray hairs? Or is it something you’d just have to live with? What about that hair dyeing product or supplement that sounds so great? Or that diet that makes so much sense? A little digging helped me to find the quickest, safest and most effective way to deal with gray hair. Did you know that you can actually reverse gray hair and get the natural color back to your hair in just days? Let’s proceed to the most effective hair color restoration solution. But before that let’s take a look at why some popular remedies and solutions just won’t do. One thing you should understand about gray hair is that it can be caused by different things in different people. Therefore no one remedy exists for every person. For a natural remedy to be truly effective, you’d have to know for certain what exactly is causing your hair to gray. That way, you can target the problem. As an example, one known cause for gray hair is Vitamin B-12 deficiency. Naturally, a diet rich in Vitamin B-12 will correct the problem, in time. But what if this is not what is causing your gray hair? You can wait for weeks and months, painstakingly sticking to some diet, and your gray hairs would still be sitting comfortably and undeterred on your head. Is that your story? Well now you know why it didn’t work. It could be coconut oil, onion juice with lemon juice, colloidal mineral, barley and wheat grass. The list goes on and on. These natural remedies will have a good overall effect on your health and will benefit your whole system, for a fact. I have nothing against them. But well, the chances of you zeroing in on the gray hair problem with these, are just too slim. Ammonia or Ethanolamine scrapes off the cuticle of your hair to let the molecules of the dye in. To set permanently, dye has to get into the hair shaft by lifting the hair’s natural protection, the cuticle. Once the cuticle is lifted, Peroxide bleaches your hair and kills off its natural color, so that it can be replaced with the new pigment. Peroxide dries and damages your hair. By this time, with your cuticle stripped away, and the natural pigment of your hair gone, your hair should be straw-like. Now, your hair is ready to receive the new pigment. At last, The new color gets deposited. What this does to your hair: it makes your hair brittle and you may start to shed. Your gray hairs suddenly multiply. And because the strands of your hair have become thin and sickly, it becomes more difficult for artificial color to keep its hold. So your hair color washes out faster than before, and you find yourself re-dyeing more frequently. Then the whole process repeats itself. Each time, your hair becomes more dead, more gray. If this is your story, now you know what happened to your hair, and why. So now, what to do when natural remedies are more of a hit-or-miss solution, and hair dyeing is too damaging? Is there one solution for every cause of gray hair? To identify an effective solution that works for everybody, we first need to be familiar with how gray hair turns gray. Let’s get to know the elements that play a role in the graying of hair. Melanin is the pigment that controls the color of the hair. When melanin accumulates oxygen or is oxidized, hair discoloration occurs. Hydrogen Peroxide is a chemical naturally produced in the hair cells. Lack of enzymes that break it down because of aging (or for some other reason) leads to excessive production of this chemical. And an excessive supply of Hydrogen Peroxide leads to melanin being oxidized. This process is called oxidative stress. In a nutshell: whatever the underlying cause, your hair goes through one and the same process when it goes gray: Hydrogen Peroxide builds up in hair follicles causing oxidative stress. Melanin gets oxidized, and this turns your hair gray. It’s basically the accumulated oxygen in melanin that makes the difference. If this oxygen is removed, the gray hair effect is reversed. Yes, I’ve learned that it can be undone – safely and naturally – using two key elements. Listen up! 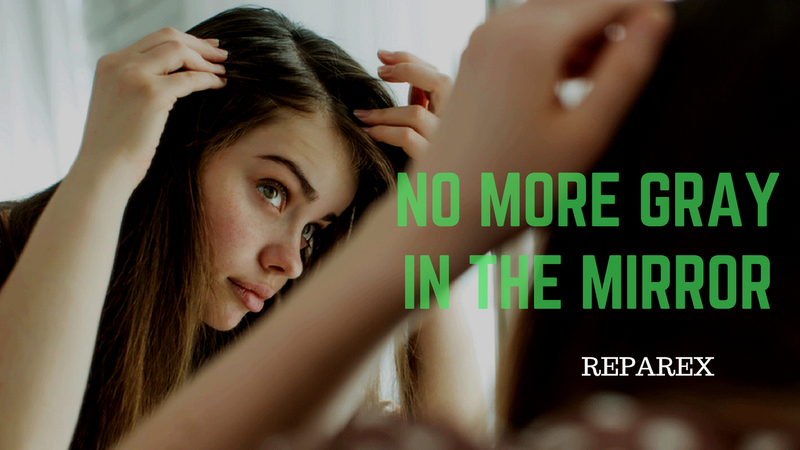 Reparex uses a unique way to restore your natural hair color. Two elements come into play. g-reductase or glutathione-reductase (an enzyme found in the human body which prevents and resolves oxidative stress) and Silver Nitrate. What Reparex does: Reparex removes oxygen from oxidized colorless melanin using the enzyme g-reductase, bound with silver nitrate. And voila! Melanin’s natural color is restored. You get your natural color back, not some artificial color. I mean, how many products can offer you that? And what’s exciting is that you don’t have to wait long. You get your natural hair color back in just a couple of weeks. Though most customers report seeing a difference in just 5 days of using the product. So what really makes this the best option for me? It’s quick: No more waiting months for that natural remedy to finally take effect. It’s effective: Reparex targets the process of graying itself, and efficiently eliminates the problem, regardless of what’s causing your gray hair. It’s safe: Because Reparex uses the healthy, natural element glutathione-reductase to get rid of oxidative stress, it’s completely safe, with no unwanted side effects. Thanks to this product, the waiting is over! You really can say goodbye now to grays – in 14 days!